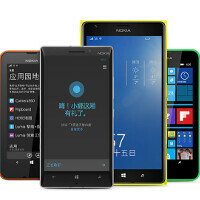 A number of Nokia Lumia models in China are receiving the Lumia Denim update starting today. The Nokia Lumia 520, Nokia Lumia 525, Nokia Lumia 526, Nokia Lumia 625, Nokia Lumia 720, Nokia Lumia 720T and the Nokia Lumia 1320 are the recipients of the update. Among the new features is one that allows you to activate virtual personal assistant Cortana by saying, "Hey Cortana." This feature requires a phone powered by a Snapdragon 8xx CPU. Other changes include the latest update to the Lumia Camera app, which helps the camera boot up faster than before. It also allows you to snap a series of pictures with just a fraction of a second between shots. And on some models, Moment Capture will allow you to record video in 4K and capture HD photos from the video. The update also allows you to add either Bing Weather or Bing Health and Fitness data to the Glance screen. Since the update is being sent out on a staggered basis, don't feel bad if it doesn't hit your phone today. It might take a few days before everyone receives it. And you can also try to manually pull Lumia Denim out of your phone by going to Settings > Phone update > Check for updates. And the Lumia Icon still waits patiently...... Can't believe that nonsense. MS is the weirdest company when it comes to updates, they update the lower end before the flagships. the 1020 is 2013 Flagship, 930/Icon is 2014 Flagship with the 1520 the Large screen flagship, neither of which has received the updates first. All Windows Phone 8 Lumia's will get this update. It will come to the 1020 soon.